A Financial Data Analyst drafts a detailed summary of the organization analyzes the financial reports of the company. 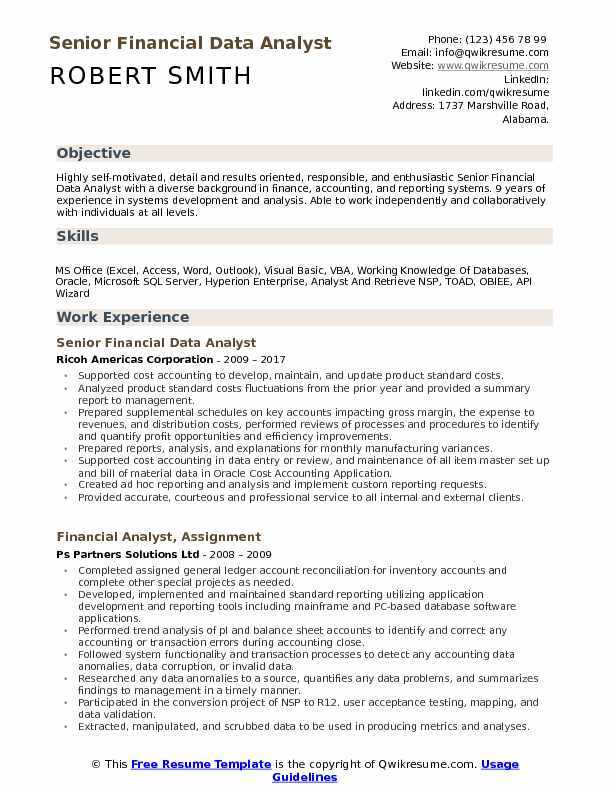 It is the primary job of a financial data analyst to identify insights and compile the analytical reports so that the management can make strong financial decisions, additionally, it is the responsibility of a financial data analyst to compile information with regards to stocks, bonds, mutual funds, and various other variable annuities. To fill the financial data analyst position the candidate must possess a Bachelors degree in finance, economics, management or accounting. 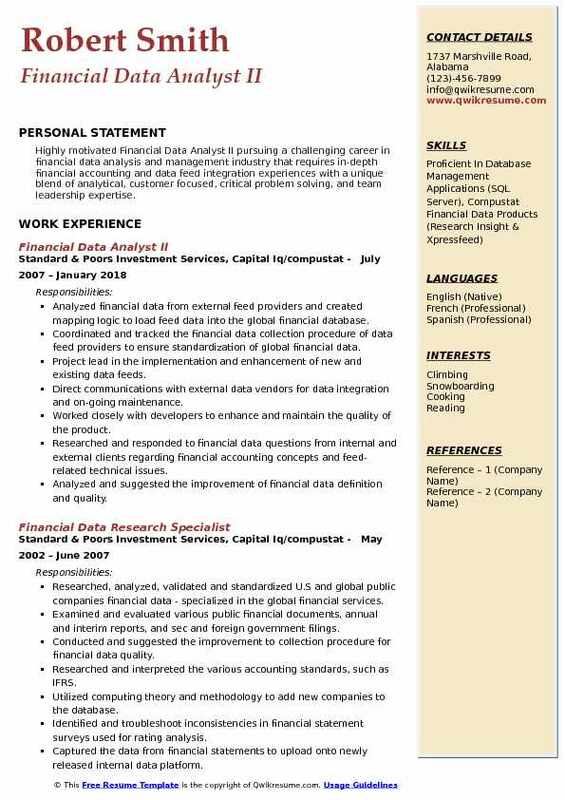 If the Financial Data Analyst resume sample contains attractive assets like technical skills with few years of experience in financial planning and data analysis, the resume will be shortlisted instantly for filling the Financial Data analyst post in top-notch companies. Summary : Highly self-motivated, detail and results oriented, responsible, and enthusiastic Senior Financial Data Analyst with a diverse background in finance, accounting, and reporting systems. 9 years of experience in systems development and analysis. Able to work independently and collaboratively with individuals at all levels. Supported cost accounting to develop, maintain, and update product standard costs. Analyzed product standard costs fluctuations from the prior year and provided a summary report to management. Prepared supplemental schedules on key accounts impacting gross margin, the expense to revenues, and distribution costs, performed reviews of processes and procedures to identify and quantify profit opportunities and efficiency improvements. Prepared reports, analysis, and explanations for monthly manufacturing variances. Supported cost accounting in data entry or review, and maintenance of all item master set up and bill of material data in Oracle Cost Accounting Application. Created ad hoc reporting and analysis and implement custom reporting requests. Provided accurate, courteous and professional service to all internal and external clients. Performed all daily reporting functions with minimal supervision. Provided assistance and technical support to end users to research data anomalies and communicate reporting procedures. 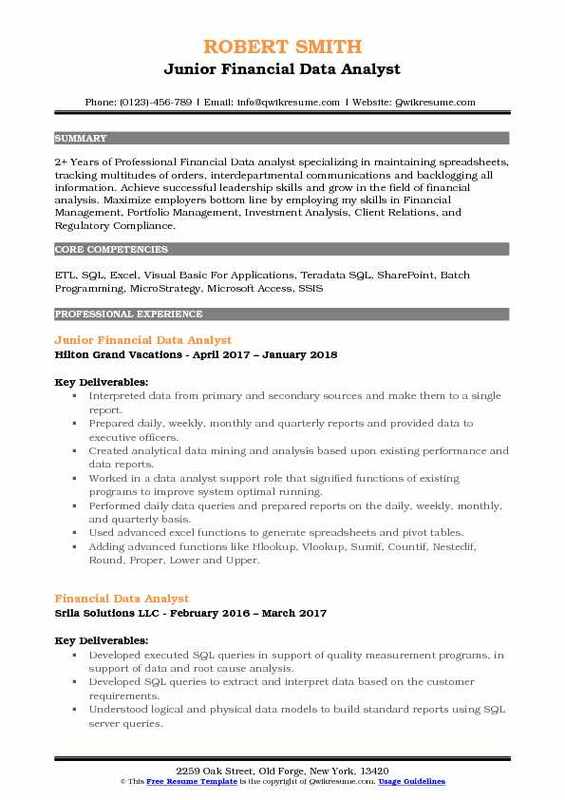 Headline : Experienced Financial/Data Analyst serving as a liaison to various interest within the company for financial planning and reporting. Proven skills in the development of financial reporting across a multi-brand platform. Achieved a high standard of a reputation for meeting deadlines and as an integral part of data comprehension and explanation that leads to key business decisions. Knowledgeable using different IT solutions for processing data and providing operational key performance metrics. Presented monthly financial results to finance directors outlining actual performance against forecast. Experienced in the creation of annual budgets and forecasts for operational sales and costs. Responsible for the creation and evaluation of sales plans for approximately 1,500 retail stores. Skilled in large dataset report building using multiple workbooks, access tables, and VBA coding. Prepare powerpoint presentation of monthly financial review for VP of Operations. Discovered $100k in unknown accrued revenues from special project account analysis. Created an audit process to reconcile repair costs and improved accuracy of financial metrics. Experienced working with ERP systems such as Hyperion, MicroStrategy and business objects. Utilized VBA coding to efficiently maintain and distribute weekly and monthly reports to the field. Performed reporting and ad-hoc analysis for repair, warranty and insurance department management. 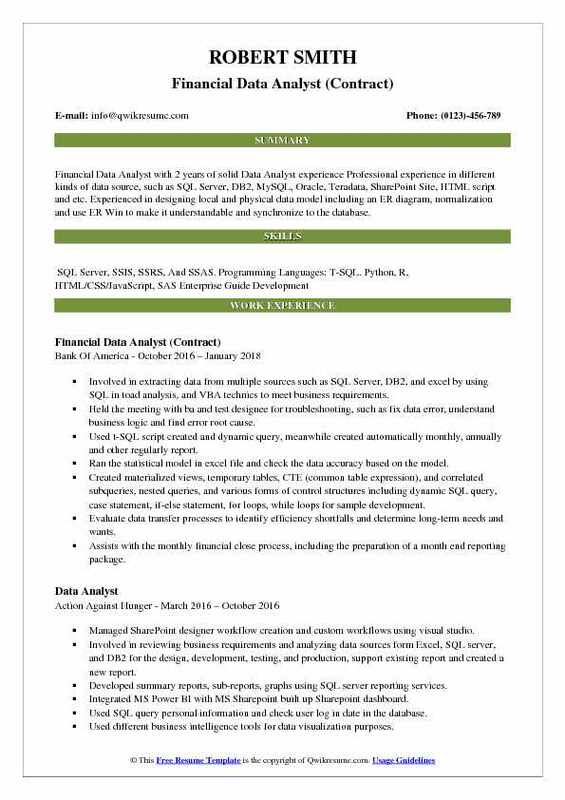 Objective : Financial Data Analyst with 2 years of solid Data Analyst experience Professional experience in different kinds of data source, such as SQL Server, DB2, MySQL, Oracle, Teradata, SharePoint Site, HTML script and etc. Experienced in designing local and physical data model including an ER diagram, normalization and use ER Win to make it understandable and synchronize to the database. Involved in extracting data from multiple sources such as SQL Server, DB2, and excel by using SQL in toad analysis, and VBA technics to meet business requirements. Held the meeting with ba and test designee for troubleshooting, such as fix data error, understand business logic and find error root cause. Used t-SQL script created and dynamic query, meanwhile created automatically monthly, annually and other regularly report. Ran the statistical model in excel file and check the data accuracy based on the model. Created materialized views, temporary tables, CTE (common table expression), and correlated subqueries, nested queries, and various forms of control structures including dynamic SQL query, case statement, if-else statement, for loops, while loops for sample development. Evaluate data transfer processes to identify efficiency shortfalls and determine long-term needs and wants. Assists with the monthly financial close process, including the preparation of a month end reporting package. Provides financial modeling support to facilitate the preparation of financial estimates and the budget process. Skills : Financial analysis, reporting, and modeling Proficient with MS Excel, Word, PowerPoint and Bloomberg application. Reviewed the cash flows for accuracy, if necessary, regenerated and saved the cash flows. Assisted or identified the reconciliation items and adds detailed comments. Assisted and actively researched/resolved the discrepancies with various agents and clients. Monitored workflow to ensure the accuracy of the cash flow reports and cash reconciliations. Liaisoned with internal groups/counterparts to ensure the accuracy of transaction flow and follows up on outstanding issues. Resolved issues effectively and timely for cash flow and reconciliation deadlines. Coordinated with the internal and external parties to resolve any settlement or deal transaction issues. Assisted and prepared various reports, as needed, for internal employees. Processed and reconciled the data attribute differences in various systems for reporting purposes. Actively monitored the securities settlement process and initiates resolution within the scope of authority, as needed. Learned deal-specific documents/indenture for performing test calculations and the report sections. 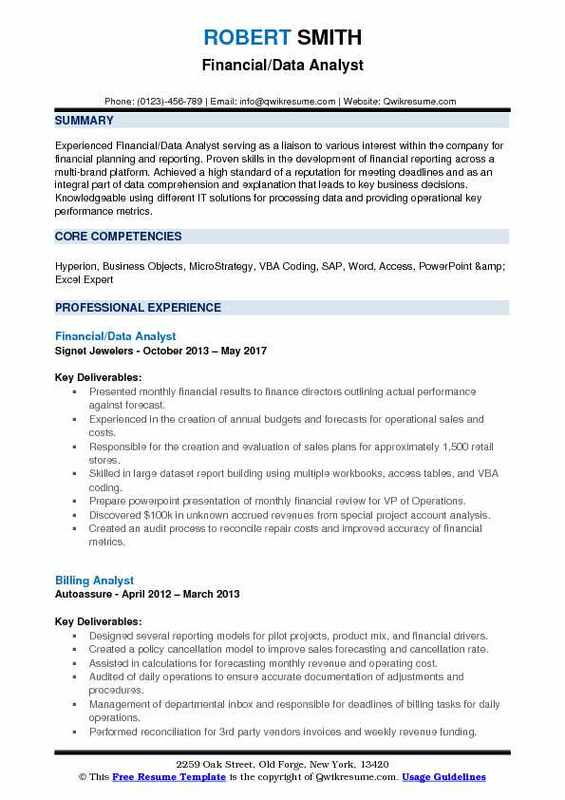 Objective : An innovative and solutions-oriented Jr. Financial Data Analyst Professional contributing over 4 years of technical and help desk support for high-profile corporations with over 1M users nationwide. Progressive computer/network operations experience in large global data centers with mixed computing environments including UNIX, Windows 8, 10 and interconnected mainframes. Gathering, combining, and processing the member data to create insightful reports which focus on developing holistic perspectives of membership trends by translating data into ready-to-use tools for executive decision-making. Producing data reports via salesforce, utilizing quantitative and qualitative research and analytical methodologies and their application. Analyzing the external and internal information resources to highlight important data points and membership trends. Acting as the main analyst for member data, dashboards, and reports in Salesforce. Developing MS Excel reports, which identified misappropriated funds through outstanding invoices. Developing financial reports and briefing binders covering accounts receivable payments and accounts payable payment receipts and membership status using MS Excel. Providing the analytical support for the department's/company's long-range strategic plan and overall performance. Synthesize large volumes of data to ensure ease of analysis and reporting. 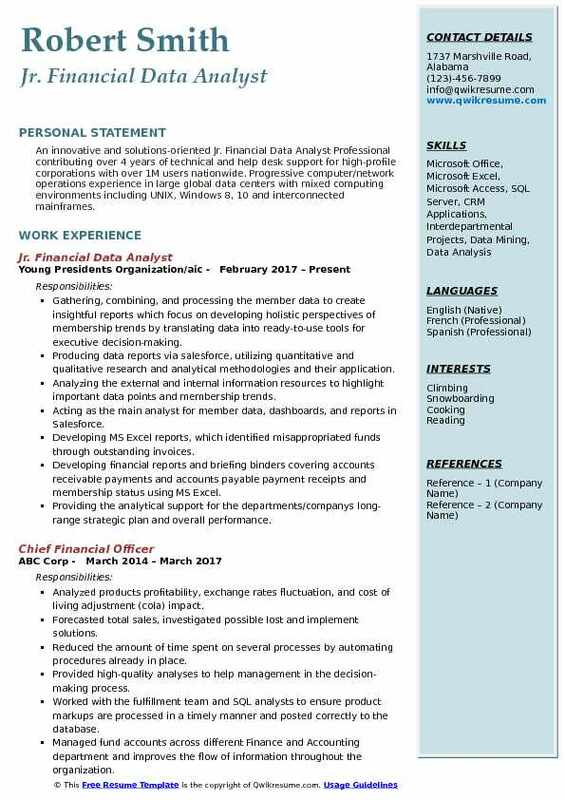 Headline : Financial Data Analyst with 6+ years of experience in PeopleSoft HCM Strong technical and analytical skills, particularly strong Microsoft Excel skills and experience with PeopleSoft HCM and Financials Succeeded in leading meetings, providing daily updates, removing obstacles to progress. Experienced in identifying gaps in current processes and tools and find new ways to improve them Designed and updated the manuals for commitment accounting procedures. Serving as subject matter expert/module delegate for PeopleSoft HCM commitment accounting and general ledger integrations including system upgrades or implementation of new features/modules. Managing all day-to-day operations related to regular payroll distribution processes in PeopleSoft HCM and Finance including journal generation of the weekly, biweekly, and monthly payrolls. Responsible for the various reconciliations which includes the validation of the data integrity between the subsystems. Working directly with users internally within finance and externally with the departments to develop operational reports using business intelligence tools. Peoplesoft functional issue resolution - including management of payroll interfaces, data integration, data extracts/reporting requests, and developing payroll analyses for management. Leading the functional development/testing of system processes or implementation of new business processes related to peoplesoft hcm commitment accounting. Developing and presenting the recommendations for business solutions through research and analysis of data and business process and implement when appropriate. Developing and maintaining the business process documentation for data management HCM and financials operations as well as training documents. 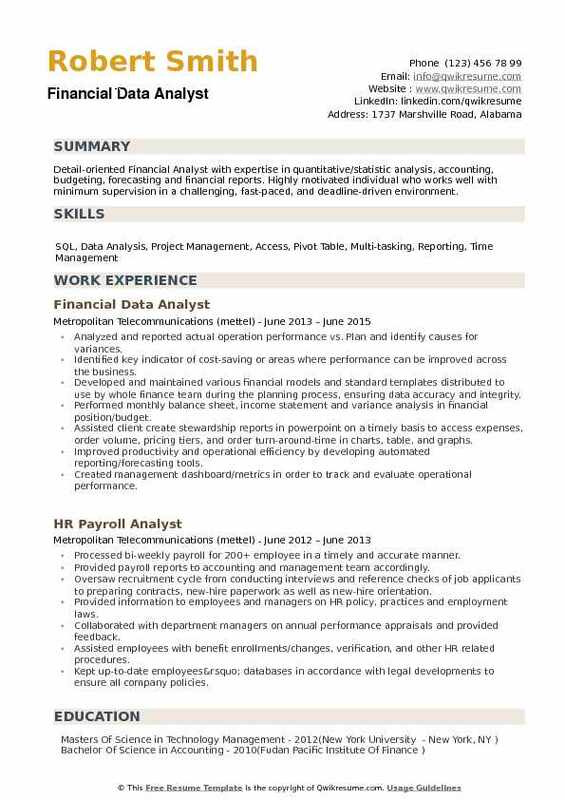 Summary : A self-motivated Sr. Financial Data Analyst with 10 years of relevant experience. Acknowledged for a proven aptitude in written and verbal communication, effective root cause analysis, and consistently delivering business results with a commitment to efficiency and excellence. A multilingual team leader with a training/process improvement background. Recognized as a trained superuser and subject matter expert for the institution’s major transition from its legacy system to the epic portfolio. Identified workflow gaps to improve patient identification, patient satisfaction and timely reimbursement of over $30m in services annually. Successfully assisted revenue cycle management, clinicians and other stakeholders across the enterprise with modifying existing processes. Increased the productivity, reduced redundancy and failed edits by 45%. Extracted and compiled data from several disparate sources to pinpoint high-cost items that affect established rates and contract performance. Developed and maintained a tracking system/database in Microsoft Excel (using pivot tables, Vlookups, etc) to identify trends and increase the efficiency of high-level charge analysis and pricing projects. Analyzed monthly and quarterly financial reconciliation reports of $15m in transplant and elective services for quality assurance and provide accounts’ status in the revenue cycle to senior management. Verified accuracy and compliance of healthcare data for an annual corporate audit of more than $8m in billed revenue. 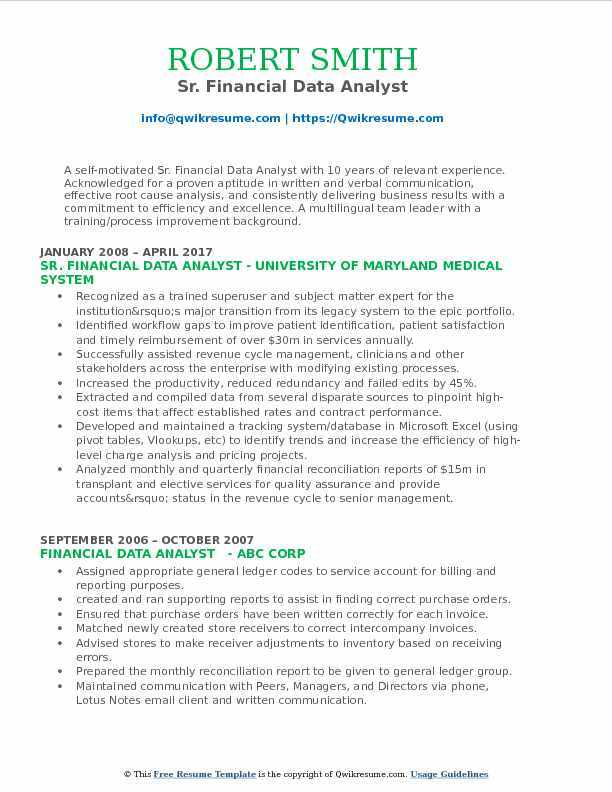 Objective : 2+ Years of Professional Financial Data analyst specializing in maintaining spreadsheets, tracking multitudes of orders, interdepartmental communications and backlogging all information. Achieve successful leadership skills and grow in the field of financial analysis. Maximize employers bottom line by employing my skills in Financial Management, Portfolio Management, Investment Analysis, Client Relations, and Regulatory Compliance. Interpreted data from primary and secondary sources and make them to a single report. Prepared daily, weekly, monthly and quarterly reports and provided data to executive officers. Created analytical data mining and analysis based upon existing performance and data reports. Worked in a data analyst support role that signified functions of existing programs to improve system optimal running. Performed daily data queries and prepared reports on the daily, weekly, monthly, and quarterly basis. Used advanced excel functions to generate spreadsheets and pivot tables. Adding advanced functions like Hlookup, Vlookup, Sumif, Countif, Nestedif, Round, Proper, Lower and Upper. Executed SQL queries for daily, weekly reports and scheduled many reports. Strong knowledge of VBA, developed many macros from scratch. Tested and implemented in daily, weekly and quarterly reports, VBA code modules include loop functions such as for, if and implemented with arrays. 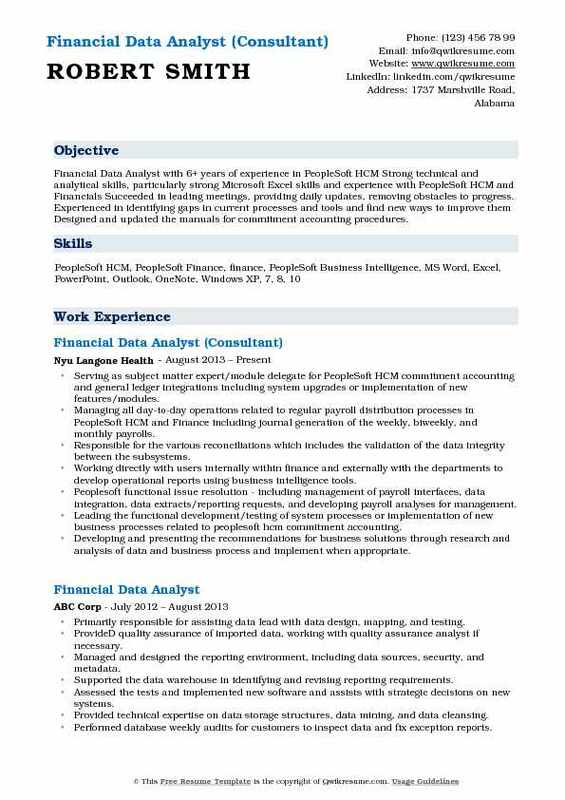 Summary : Highly motivated Financial Data Analyst II pursuing a challenging career in financial data analysis and management industry that requires in-depth financial accounting and data feed integration experiences with a unique blend of analytical, customer focused, critical problem solving, and team leadership expertise. Analyzed financial data from external feed providers and created mapping logic to load feed data into the global financial database. Coordinated and tracked the financial data collection procedure of data feed providers to ensure standardization of global financial data. Project lead in the implementation and enhancement of new and existing data feeds. Direct communications with external data vendors for data integration and on-going maintenance. Worked closely with developers to enhance and maintain the quality of the product. Researched and responded to financial data questions from internal and external clients regarding financial accounting concepts and feed-related technical issues. Analyzed and suggested the improvement of financial data definition and quality. Due diligence validation and testing of fundamental and equity issue data using SQL query performance. Developed and organized training for special projects involving select financial data items. 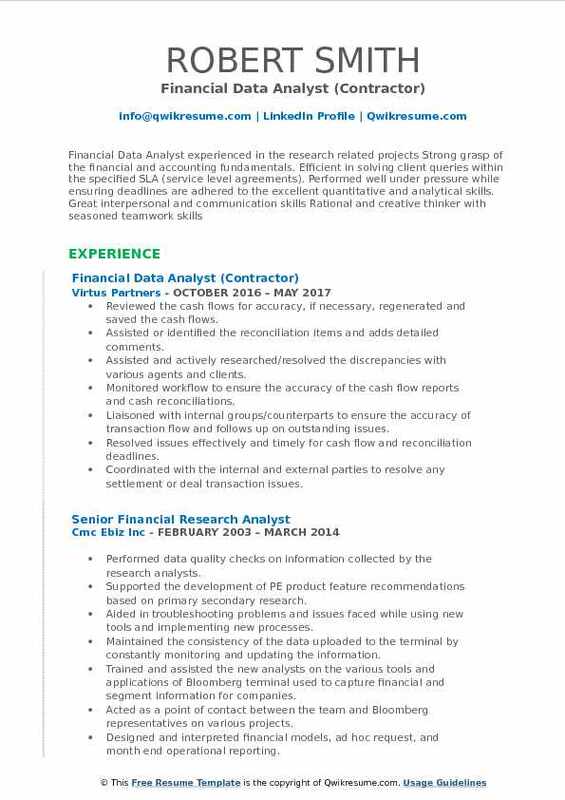 Objective : Detail-oriented Financial Analyst with expertise in quantitative/statistic analysis, accounting, budgeting, forecasting and financial reports. Highly motivated individual who works well with minimum supervision in a challenging, fast-paced, and deadline-driven environment. Analyzed and reported actual operation performance vs. Plan and identify causes for variances. Identified key indicator of cost-saving or areas where performance can be improved across the business. Developed and maintained various financial models and standard templates distributed to use by whole finance team during the planning process, ensuring data accuracy and integrity. Performed monthly balance sheet, income statement and variance analysis in financial position/budget. Assisted client create stewardship reports in powerpoint on a timely basis to access expenses, order volume, pricing tiers, and order turn-around-time in charts, table, and graphs. Improved productivity and operational efficiency by developing automated reporting/forecasting tools. Created management dashboard/metrics in order to track and evaluate operational performance. Provided ad-hoc reports and analysis as required to support management decision and strategic initiatives. Responsible for monthly close activities, including journal entries, variance analysis, and reconciliations.